University of Wisconsin-Madison News: In a high carbon dioxide world, the trees would come out ahead. Except for the munching bugs. A new study published today [Monday, March 2, 2015] in Nature Plants shows that hungry, plant-eating insects may limit the ability of forests to take up elevated levels of carbon dioxide in the atmosphere, reducing their capacity to slow human-driven climate change. The finding is significant because climate change models typically fail to consider changes in the activities of insects in the ecosystem, says Richard Lindroth, a professor of ecology at the University of Wisconsin-Madison and the leader of the study. The research suggests it’s time to add insects to the models. Carbon dioxide typically makes plants grow faster and makes them more efficient in how they use nutrients. But the amount of damage caused by leaf-munching bugs in the study nearly doubled under high carbon dioxide conditions, leading to an estimated 70g of carbon-sequestering biomass lost per meter squared per year. 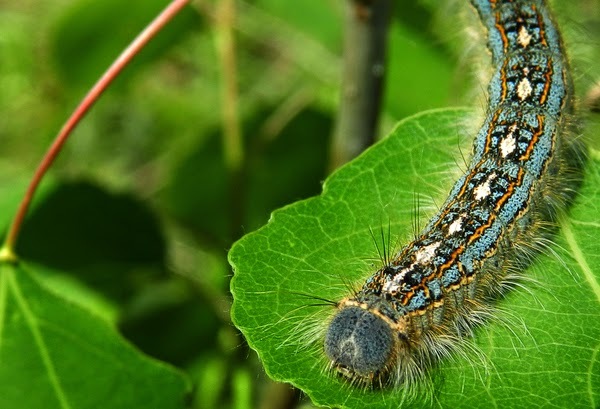 “This is the first time, at this scale, that insects have been shown to compromise the ability of forests to take up carbon dioxide,” Lindroth says.